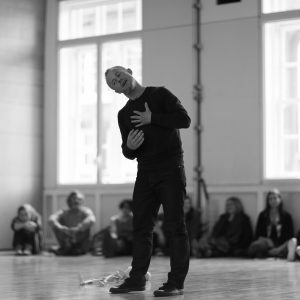 Charlie Morrissey is a director/choreographer, performer, teacher, and researcher, who has been working in the field of performance for nearly 30 years. His work is influenced by ongoing working relationships with Steve Paxton, Siobhan Davies, Lisa Nelson, Kirstie Simson, Scott Smith, Katye Coe, K.J.Holmes, Katie Duck and others. Teaching is central to his practice and his classes are laboratories for exploration and discovery. He teaches for dance and theatre companies, institutions, festivals and independent organisations internationally. Recent and upcoming projects include performances of Materials rearranged to be with Siobhan Davies Dance; What Happens When – a commission from Joint Adventures with Andrea Buckley, Orlando Gough and members of the Munich Philharmonic Orchestra in Munich; he is creating a new group work If this is it, then what are we going to do with it with Ben Ash, Neil Callaghan, Katye Coe, Tom Goodwin and Susanna Recchia; Charlie is performing a solo directed by Colin Poole and also in Quarantine’s Wallflower this Autumn.